Pain is a very individual sensation and no two people will respond the in the same way to medications. Pain is a symptom not a diagnosis and exists to inform that something is wrong. Before any medication is sought the correct diagnosis must be made to ensure the most appropriate medication is advised. The most common types of medication available to those suffering from back pain are Topical Preparations, Non-Steroidal Anti-Inflammatory Drugs, Acetaminophen, Muscle Relaxants and Narcotics. All have their own qualities and target pain differently. Alcohol avoidance is recommended when taking any medications for pain. Topical treatments are used on the skin and are often seen in the form of a cream or a spray. They are useful because they cause fewer side-effects than oral medications. They are applied to the site of pain and work by stimulating the nerve endings into altered sensation and reduce inflammation and swelling. Caution must be taken in the presence of broken skin, rashes, asthma or with other medications as the same ingredient may be in both, leading to accidental overdose. Available without prescription, these drugs are effective in lower back pain and muscular strains/sprains. They work by interfering with the chemicals responsible for causing inflammation and swelling. They are inexpensive and typical NSAIDS include Ibuprofen, Aspirin and Diclofenac. Always use as directed and NEVER exceed the stated dose. Caution should be taken with the presence of asthma, if there are any concerns, always seek advice from the on-duty pharmacist or ring NHS Direct on 0845 4647. This drug is the most commonly used as it has the fewest side-effects, there is no chance of addiction or becoming tolerant, does not interfere with the gastro-intestinal tract and has the lowest allergic rate. It works by altering the person’s pain receptors in the brain thereby altering pain perception and sensation. It is fairly inexpensive, and is effective in the treatment of both mild and moderate pain. Paracetamol is found in many non-prescription drugs, so always read the ingredients of other medicines being used, if paracetamol is being taken for pain. Over-dose can lead to liver damage; caution must be taken with those who suffer with liver impairment. Muscle relaxants work by inhibiting the pain responses in the nervous system and decreasing muscle tone.They are effective in the treatment of muscle spasm and can improve movement. They work effectively when given in combination with an anti-inflammatory drug. Side-effects include nausea and drowsiness so caution must be given when operating machinery or driving. The most common type of muscle relaxant given for pain relief is benzodiazepine. It is best taken at night due to the potential for drowsiness and can be used to aid a restful sleep. Narcotics can be divided into two groups, opioids and opiates. Opioids are a chemical that is found in humans or a very close synthetic imitation and opiates are derived from plant sources commonly the poppy. Both are purely prescription only, and are most effective in the treatment of acute pain, post-operative pain and occasionally in the incidence of chronic pain as long term use can result in a tolerance or dependence; if they are given for chronic pain, dosages must allow for this occurring. They are usually prescribed in conjunction with a NSAID and work by attaching to receptors in the brain, spinal cord and gastro-intestinal tract. They interfere with the transmission of pain messages and alter the sensation of pain. When prescribed for chronic back pain, and long term use is expected, alternative routes of administration can be offered. Speak to your GP or Specialist Pain Team at your nearest hospital. Side-effects of narcotics include drowsiness, nausea, vomiting and constipation. A more serious side-effect is respiratory depression; if this occurs, seek immediate medical advice. There are a selection of alternative medications used in the treatment of back pain such as anti-depressants, anti-seizure drugs and natural remedies. These are discussed in more detail in other sections. 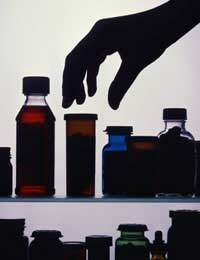 All medications require the user to exercise care at all times when handling the drugs. Always take as directed and discuss with your doctor if you are unsure or feel your combination is not ideal. Sometimes a combination of drug groups is needed to achieve an acceptable level of pain relief for the sufferer.